England in the 15th century – a snapshot. Lollards“, Henry replied ” I will be the protector of the church”. A dreadful period of persecution was to follow. In 1401 Henry authorised a statute against heresy , referred to as the “Ex officio” statute as all the prosecution and proof was laid to the prelates and if found guilty, the civil authority was obliged (had) to do the execution by burning. The latin title was De Heretico Comburendo meaning “Regarding the heretic who is to be burnt”. This act became the means for routinely burning alleged heretics, requiring just clerical condemnation (easily given) and reference to the local magistrates who were bound to burn the prisoner. This greatly facilitated the murderous work of the prelates. Henry IV was known as “the prince of priests” for his devout support of the Church. bound in chains, as if a spit roast. Again there were times when young even infant kings (Henry VI was under one year old when he came to the throne; Edward V was but 12 years old) were subject of Regency. This too, offered an environment that was exploited by the Church in its continuous assault on alleged heresy. This is evidenced by the issue of letters patent by the seven year old Henry VI 6 July 1428 ( Regent Humphrey, Duke of Gloucester) to the keepers of Colchester Castle to apprehend a priest William White `and other Lollards`. There followed a purge that ranged through Essex, Suffolk and Norfolk whereby some 110 persons (at least) were known to have been taken up. In most cases they abjured their alleged sins and did penance but the threat of burning was ever present, especially for the dozen or so priests and vicars among them. The Wars of the Roses between the house of Lancaster and York is a story all its own. But briefly, Edward, son of Richard of York became leader of the Yorkists when his father was killed in battle. The Lancastrians were defeated at Mortimers Cross in 1461 when he became king. He suffered some set backs in 1469 and went abroad briefly before returning and re establishing himself with battles won at Barnet and Tewkesbury. Much of his reign was spent in failed attempts to regain lands in France in which he was from time to time funded by the church, who thereby were able to continue their pursuit of heretics. He was succeeded by his son Edward V, under the Regency of his uncle, the Duke of Gloucester. Edward and his brother the Duke of York were “the princes in the Tower” who were locked away when Gloucester seized the throne as Richard III. The Princes were murdered, possibly suffocated while they slept. Richard was soon afterwards killed at the battle of Bosworth by Henry of Richmond, son of Edmund Tudor. Henry was accepted as king by Parliament and became Henry VII (r1485-1509), of the House of Tudor. What should be recognised is that during this period there was an increase in trade with foreign countries, especially with Holland. Edward III was responsible for introducing many Flemings to England who laid the foundation for the English textile industry. Edward IV also entered into many commercial contracts with continental traders. Not only was there increased trade and prosperity but with it came information and ideas. So far as religion was concerned, the close of the 15th century saw superstition triumphant with all power in the hands of the oppressors – a corrupt clergy beyond credibility. Ignorance was maintained in the people by artifice and mumbo jumbo while the churches and monasteries overflowed with wealth thereby funding the sensual clerics from the Pope down. Caught by ignorance and superstition, the people allowed themselves to be overcome by the priests, and yielded a rich harvest to the church. learning, education, and art emerged on the Continent with many eminent, well educated thinkers and writers, including the great humanist Erasmus. a new `information age`. The new skill of printing dispersed from Mainz when it was sacked in 1462 with presses appearing in Rome in 1467; Paris in 1470; Cracow in 1474 and London in 1476. With printing came the necessary sister trade of papermaking. 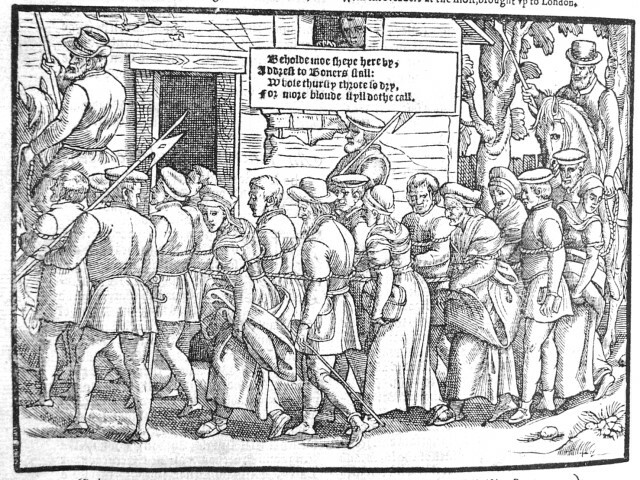 The printed word opened peoples minds as leaflets, religious tracts, books and an English Bible began shaping the views of the common people. By the time Martin Luther was born (1483) printing was established throughout Europe and there was increasing literacy and numeracy among the common man. Thomas Cranmer and latterly Hugh Latimer. conscience, and the availability of the written word.